The bloodstains, as forensic scientists and chemists now know, are from real human blood. Moreover, the stains are from real human bleeding from real wounds on a real human body that came into direct contact with the cloth. Immunological, fluorescence and spectrographic tests as well as Rh and ABO typing of blood antigens reveal that the stains are from human blood. When the stains formed, the man was lying on his back with his feet near one end of the fourteen foot long, banner shaped piece of cloth. The cloth was drawn over the top of his head and loosely draped over his face and the full length of his body down to his feet. Many of the stains have the distinctive forensic signature of clotting with red corpuscles about the edge of the clot and a clear yellowish halo of serum. The forensic experts are also able to identify that some of the blood flow was venous and some was arterial. Most of the blood flowed while the man was alive and it remained on his body. There is some blood that clearly oozed from a dead body, as was the case for stains resulting from a wound in the man’s chest. Here, the blood, with a deeper color and more viscous consistency, as is the case for blood from a postmortem wound, ran from a chest wound, flowed around the side of the body and formed a puddle about the man’s lower back. Mingled with these large bloodstains are stains from a clear bodily fluid, perhaps pericardial fluid or fluid from the pleural sac or pleural cavity. This suggests that the man received a postmortem stabbing wound in the vicinity of the heart. Blood that flowed along once-outstretched arms emanate from the victim’s wrists and course their way downward along the forearm, past the elbow and onto the back of the upper arm. Near the man’s armpit the blood pooled and likely dripped to the ground. So much blood flowed along his outstretched arms that several rivulets of blood, pulled by gravity, ran straight down. It seems likely that blood dripped all along the man’s arms like rain drips from a tree branch in a storm. From the angles of the flows and rivulets, forensic experts have determined that this blood flowed while the man was upright with his arms at angles like the hands of a clock at ten minutes before two. They can also see from changes in bloodstream angles that the man must have pulled himself up repeatedly, perhaps raising himself up to relieve the weight on his nailed feet, perhaps to relieve the pressure on his chest that he might breathe. The clots, the serum separations, the mingling of body fluids, the directionality of the flows, and all other medically expected attributes would have been nearly impossible to create by brushing or daubing or pouring human blood onto the cloth. The blood, rich in the bilirubin, a bile pigment that the body produces under extreme trauma, is unquestionably the blood of the man whose lifeless, crucified body was enshrouded in the cloth. The images pick up where the bloodstains leave off in revealing even more chilling, horrific pathological detail. Within those unexplained body images, the details of piercing wounds, lacerations, bruises, contusions, and abrasions are medically accurate. The man’s once-outstretched arms are modestly folded at the wrists. It is on the images of the arms that we see the rivulets of blood. It is on the man’s chest, between the fifth and sixth ribs that we see an elliptical gash from which the blood flowed under the man’s lower back. We see the horrific wounds where the man was nailed to the cross. So accurate are the details, medical experts realize they demonstrate knowledge of pathology that was not understood in the Middle Ages; not by artists, not by crafters of fake relics, and not by the best medical minds of that age. How did this relic forger translate such medically accurate detail, both front and back images, onto the long piece of linen cloth? What emerges from the cloth is an epic story, a reenactment of the passion sequence from the scourging, the walk to Calvary, the crucifixion, and the burial. The man of the Shroud was savagely flogged. Whatever was used, it is consistent with a Roman flagrum, a whip of short leather thongs tipped with bits of lead, bronze or bone which tore into flesh and muscle. There are dozens upon dozens of dumbbell shaped welts and contusions, the type of wound that the flagellum would have caused. There is blood from the flagellation and even a bit of tissue thought by medical experts to be a torn-out bit of muscle. From the angles of attack – the way the marks fall on the man’s back, buttocks, and legs – it seems that man was whipped by two men, one taller than the other, who stood on either side of him. At some time, the man may have been forced to wear a crown of thorns. That seems to be a logical explanation for the numerous puncture wounds about the top of his head. But from the wounds and drops of blood, it seems to have been more like a rough bunch of thorns, or a cap of thorns, and not like the wreath shaped crown of thorns so common in artistic depictions. There are details on the shroud that suggest both a beating and falling: a severely bruised left kneecap, a dislocated or possibly broken nasal cartilage, a large swelling around the right eye socket and cheekbone. There is, too, the puzzling fact that there are significant abrasions on both shoulders. On the shoulders, welts from the apparent scourging are abraded as though rubbed over. Might this be from carrying the patibulum, the crossbeam of the cross, across both shoulders? What is most interesting is that the man of the Shroud was crucified with large spikes driven through his wrists and not through the palms of his hands, something which contradicts all iconography of medieval and pre-medieval periods. This is evidenced by both the image and the bloodstains. This is, of course, more historically and medically plausible. It was not before the first part of the 20th century, that medical experts first realized that nails driven through a man’s palms would not support a his weight – even if his feet were nailed or supported – and that the nails would tear out. That the Romans did crucify victims by driving nails through the wrist area of the forearm was confirmed by the 1968 archeological discovery of a crucifixion victim, named Johanan ben Ha-galgol, found near Jerusalem at Giv’at ha-Mivtar. If indeed the Shroud is a medieval forged relic, the craftsman who produced it knew how to do it right even if the nailing, the scalp wounds, and the man’s nakedness defied the sensibilities of the time. 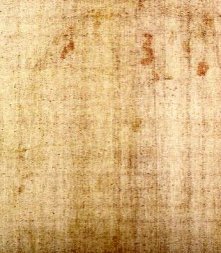 The Shroud is more mind-numbing than all other depictions ever made; from the earliest carvings of the crucifixion on 5th century coffins; from the wall painting of the passion so prominent in old English parish churches; from the imaginative grandeur of paintings by Rubens, Raphael, El Greco, and Velazquez; and from the spiritual visualizations of Salvador Dali. It stirs our imagination more than the drama of medieval mystery plays still performed in York or modern Broadway musicals and movies.